This article was published in the September-October 2017 issue of Policy Magazine. [Ottawa – September 1, 2017] Attitudes to trade wax and wane as the issue fades in and out of political discourse. We have now entered a moment where debates about trade are occupying centre stage in the political arena. [Ottawa – April 25, 2017] The election of Donald Trump last November shocked most observers of U.S. politics. The major consensus predictions favoured a Clinton victory by an overwhelming margin. Heading into election night, The New York Times pegged the odds of a Clinton victory at 85%. Others published similarly high odds for a Clinton win, including: FiveThirtyEight.com (71% chance), Huffington Post (98% chance), PredictWise (89% chance), the Princeton Election Consortium (99% chance), and Daily Kos (92% chance). Canada 150: The End of Progress? The following presentation was delivered by Frank Graves to the Queen’s Policy Review on April 27, 2017. This report represents a synthesis of public opinion findings from EKOS and others to help understand Canadians’ attitudes regarding what it means to be middle class today. This report was prepared for the Privy Council Office, and follows a review of the academic literature which looks at the evolving forces shaping the middle class from an economic and sociological perspective. The views expressed in this report are those of EKOS Research Associates, Inc., and do not necessarily reflect the views of the Government of Canada. WHAT DOES THE CITIZENRY WANT? This article was published in the November-December 2016 issue of Policy Magazine. [Ottawa – November 1, 2016] The issue of electoral reform is of great importance to citizens. The issue does not produce the same visceral immediacy as debates about health care, climate change, and economic stagnation. It does, however, find its roots in deep historical shifts in the relationships between citizens and their governments. 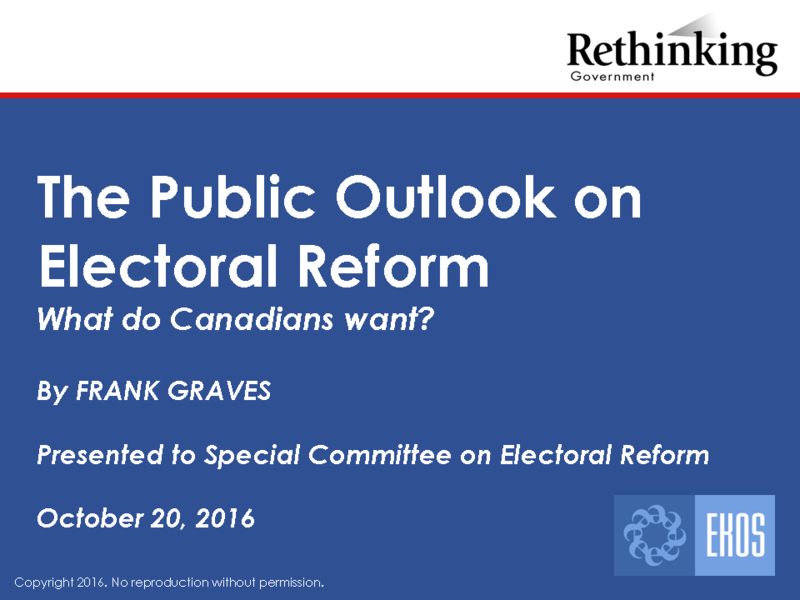 The following presentation was delivered by Frank Graves to the Special Committee on Electoral Reform on October 20, 2016. Please click here for a PDF copy of this presentation. Veuillez cliquer ici pour la version française. A video of this presentation (as well as the Q&A period) can be found here. Please click here for a copy of the questionnaire used to conduct this survey. Please click here for the data tables for this survey. The following presentation was delivered by Frank Graves to the 2016 Queen’s International Institute on Social Policy held from August 22-24, 2016 in Kingston, Ontario. VIDEO: Is Security a Priority for Canadians? Evan Solomon speaks with Frank Graves, President of EKOS Research Associates, about where security issues rank among voter issues. This article was published in partnership with the Institute for Research on Public Policy (IRPP). Full article available here. [Ottawa – December 3, 2015] When Parliament resumes later today, Justin Trudeau will enter the House of Commons with a majority of seats. Last night, Evan Solomon met with Frank Graves to do discuss how the Liberals were able to leapfrog from third place to first place. The following presentation was delivered to the Forum on Public Opinion Polls from the 2015 Federal Election hosted by the Marketing Research and Intelligence Association (MRIA) on November 26, 2015. …BUT SHOULD WE HAVE BETTER POLLING YARDSTICKS? [Ottawa – March 12, 2015] Canada has been singularly successful in solving the postmodern riddle of the clash of civilizations. While Europe and America have torn themselves apart over issues of immigration and race, Canada has been remarkably spared this particular affliction. All of this may be drawing to a close.